A rush to open Staples Center in time for the Lakers’ 1999-2000 season led the owners to take shortcuts in the design of luxury suites, contributing to the death 11 years later of a toddler who fell over a 10-inch-high glass barrier spanning the rear of a food and beverage shelf, an attorney told a jury today. Wellman, who represents the parents of 34-month-old Lucas Tang, who died on Nov. 21, 2010. 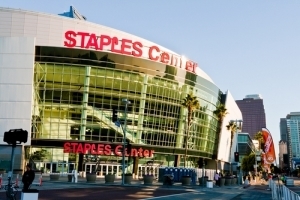 But Dana Fox, an attorney for the owners and operators of the arena, told the Los Angeles Superior Court jury hearing the case that the boy fell 25 feet to his death because of his mother’s negligence.